Many of us hit a financial roadblock at some point in our lives and it can be very stressful to face a financial crisis and just as hard to keep a clear head and focus on finding a positive way out of the situation. It is never a good idea to hit the panic button when you are in a bit of a financial hole as you could end up digging an even bigger hole that you might struggle to get out of for a while, but one option to consider is a short term loan, which could be the right thing to do if it is a good fit for your circumstances. If you are going to apply for a loan, an honest review of the lender would help, plus some solid reasons why you want to borrow the money in the first place. Here is a look at some of the ways a short term loan might offer you a path forward with your finances. If you have decided that you need to borrow some money to plug a short term gap in your finances it is important to think carefully about how much you actually need rather than apply for an amount that you think you need. Taking out a loan that is bigger than required is a bad strategy for a number of valid reasons. A big point to consider is that if you get accepted for the larger amount you asked to borrow you will be paying more in repayments and interest charges, whereas the loan will be more manageable and cost-effective if you sit down and work out precisely what you need before making any application. You are also more likely to get accepted for a short term loan if you ask for a smaller sum of money. You might be in need of a bit of money to plug a hole in your finances, which is why you are thinking about taking out a short term loan in the process, but there are some other potential benefits attached to that strategy. If you are granted the loan and pay it back on time it can have a positive impact on your credit score and help to repair any potential damage you have done with other accounts. On the other hand, defaulting on a short term loan would be bad news for your score, so take the offer and help and repay the lenders faith by paying it back and do yourself a favor by building your credit score with good payment behavior. Another valid reason for considering a short term loan is when you have arranged another other finance to complete a deal, for example, but there is a delay before you get that deal completed. A short term loan could be an effective way of bridging your need for funds immediately, which can then be repaid once the other transaction is in place. It is not necessarily a sound strategy to borrow money to cover another loan repayment and this action could worsen your cycle of debt if you are not careful, but there are some circumstances where this course of action might be justified. If you are sure that your circumstances are going to improve and you just need that bit of breathing space for a few weeks or so, it might help you to avoid a default by getting a loan to cover an urgent payment. Think very carefully about borrowing money under these circumstances but if you have truly exhausted all other options available, a short term loan might help you to avoid a worse financial scenario. If you need access to some funds in a hurry there will not be enough time to apply for a loan where you have to offer up some security. The vast majority of short term loans are unsecured and that means you can get approved and get the money in a short space of time without having to offer any collateral. It is not just the time element that is beneficial. Getting an unsecured loan will mean that you don’t have to tie up any of your assets. Not that you want to contemplate the consequences of default, but the other point to make is that with a short term loan that is unsecured, you don’t have the threat of losing your home or car hanging over you. Finally, it is worth pointing out that short term loans can offer a degree of appeal to borrowers simply because they offer flexible terms and are, therefore, less rigid than a longer term loan option. Borrowing money over a short period of time gives you options and you can even repay the loan early if your circumstances allow you the opportunity to do so. Flexible terms are also an option, as you could borrow money where you only pay the interest every month, then at the end of the loan period, you pay off the capital sum that you borrowed. This is often referred to as a balloon option and that could give your finances the flexibility they need while you gather your financial situation and make plans for the future. 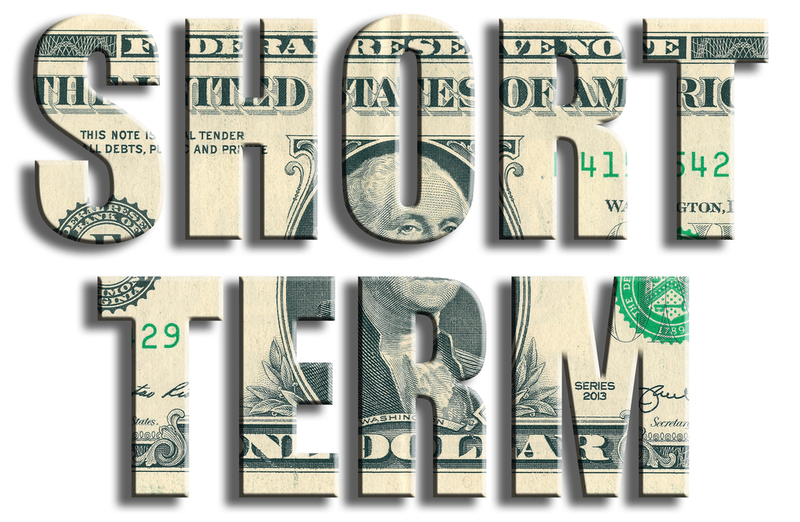 Short term loans are a popular option if your situation demands a quick fix and you just need an opportunity to get your money situation back on track. There always has to be a reason why you need to borrow some money and whether it is to cover a bill that needs paying urgently or if it is because you are trying to repair your credit score and want to demonstrate fiscal responsibility, a short term loan might just be the solution that you are looking for.